Some Top-40 stations come and go. Others, like KIIS FM, come and stay. Then there are those who become the stuff of legend. One such station was KHJ, a top-40 outlet at 930 on the AM dial. From a year after the birth of Beatlemania to a month before the death of John Lennon, KHJ brought Southern California the latest and greatest hit tunes. KHJ was one of the oldest stations in the Los Angeles market, having made its first test broadcast April 11, 1922. The station was dedicated two days later. In 1922, all stations in the new 'broadcasting' service shared the same frequency/wavelength, 833 kilocycles or 360 meters. (Imagine, being told you can only be on the air for half an hour or an hour, since the next station has to get its turn on the air!) About 15-25 stations in L.A. all took turns going on and off the air on 360 meters. During 1923 and 1924, the AM broadcast band finally expanded from 833 and 750 kc, and stretched from 550-1350 and later to 1500 kilocycles. Purchased by Cadillac dealer Don Lee in 1926, the station was moved up to its present 930 frequency in March 1941, when the AM band expanded from 1500-1600 kc. An FM outlet, K45LA, was also launched that year. During its top-40 days KHJ was owned by RKO General, which also owned KHJ-TV channel 9 in Los Angeles. 93 KHJ "Boss Radio" became a hit music station in May 1965. For about three years its competition was its neighbor on the dial, long-time hit station KFWB "channel 98". In March, 1968, KFWB threw in the towel and switched to an all-news format. Boss Radio was king. The station's DJ roster read almost like an all-star list, with the likes of such talent as Charlie Tuna, Johnny Williams, Machine Gun Kelly, Billy Pearl, Bobby Tripp, Mark Elliott, Bill Wade, Robert W. Morgan, Bobby Ocean, Humble Harve, Jerry Butler and Sam Riddle. (In the sixties, Riddle also hosted a TV show called Groovy Game on Channel 9.) The Real Don Steele, already experienced on several stations around the country, became a legend on KHJ, and his fast-paced, quick-witted style was the inspiration for jocks of many years to come. Perennial morning man Charlie Van Dyke cut his own 45-rpm record that actually made it to the station's top 30 list in the summer of 1976: The Flag, a spoken word piece backed by patriotic music, which celebrated our nation's symbol. In the mid seventies KHJ hired its first female DJ, a lady who went by the single name of Shana. A second female DJ, Sally Adams, came aboard in 1977. Once in a while they'd poke fun at other rock stations. One day, as the song Fame was ending, the DJ came on and did an uncanny impression of a KLOS jock saying "Alright, a little David Bowie there...." then, switching back to his regular voice asked, "What's the matter with these FM DJs? They think they're gonna wake somebody up?" They'd also occasionally poke fun at their own personalities. A DJ once said that KHJ was the place where "when Charlie Van Dyke cuts himself shaving in the morning, he bleeds coffee." KHJ once had a contest where if you counted the number of times Ringo Starr's hits were played one weekend and were the first one to the station with the correct answer, you won dinner for two with Ringo. Another time, a message by Elton John was scrambled and the first person to correctly decode it won something really big. During the mid-seventies, Los Angeles had the good fortune of being graced with the KHJ Coca-Cola Concert Caravan, a series of summer concerts at random shopping mall parking lots around the southland. Spanky & Our Gang played Del Amo Fashion Square. Laurel Plaza hosted The Hudson Brothers. Early '70s stars Rare Earth and King Harvest jammed at a mall in Montebello. Novelty act Larry Groce (Junk Food Junkie) co-starred with Pratt & McClain (Happy Days theme) at Northridge Fashion Square. The Ramones were scheduled to play a parking lot in 1977, but got pulled at the last minute and replaced by Stephen Bishop. And a shopping mall in Costa Mesa greeted big time act England Dan & John Ford Coley. All these concerts were free, along with all the Coca-Cola you could drink. With the rise of FM top-40 initiated by KIQQ in 1973 (and continued by other stations as time went on), KHJ's ratings began a slow downturn. Serious AM competition came around Christmas 1976 when KTNQ signed on just up the dial with its "anything goes" top-40 format. This proved to be a wake-up call for KHJ. They expanded their music selection slightly, but except for Black Betty by Ram Jam, their wider playlist went in a different direction than Ten-Q. Aiming to attract older listeners, they added a few album cuts like Bob Seger's Main Street and The Eagles' Life In The Fast Lane, and even played some tunes more suited for FM AOR, like Led Zeppelin's Kashmir (uncut!) and Emerson, Lake & Palmer's From The Beginning. In May 1977 their top-40 charts became eight-page foldouts featuring song lyrics on one page, concert and giveaway information on a couple of others, and in-depth information on any given artist. These deluxe foldouts were too expensive to produce for very long, and in 1978 they went back to their single-sheet top 30 charts. Later, they created "KHJ Sun Stickers" for your bumper or windshield. Signs that the station was in trouble became noticeable in the summer of 1980 when the two biggest songs of the year failed to make the KHJ playlist: Queen's Another One Bites The Dust and Devo's Whip It. A number three song, Together (by the group Tierra) also got snubbed, as did Bette Midler's ballad The Rose. At 9 PM on November 7, 1980, KHJ switched over to a country music format. Competing with the likes of upstart KZLA and top-rated KLAC, it lasted barely two and a half years. In April 1983 they switched back to a top-40 style format, declaring on the air that "The Boss Is BACK", and even invited listeners to tune in KFI or KRLA and decide for themselves. At first they seldom played anything that came out after 1980, and added older songs they'd previously passed over like Bruce Springsteen's Born To Run, Meat Loaf's Two Out Of Three Ain't Bad, and Ambrosia's Holding On To Yesterday. On January 31, 1986, KHJ abandoned its classic call letters and adopted those of its FM outlet KRTH. They began playing "Smokin' Oldies -- from the first ten years of rock 'n' roll" and the air was filled with the likes of Elvis Presley and Bobby Darin. This format lasted until the late 1980s, when they became a simulcast of KRTH-FM. Ironically, they had been sold and the format dropped just before receiving news of their best ratings book ever. In the early '90s they went Spanish, changing their call sign to KKHJ. The station was "Radio Noticias" with an all-Spanish news format, and then "La Ranchera". In one of the best legal moves in recent history, the argument was made (successfully) that the calls "KKHJ" could not be said in Spanish over the air as the "KK" pronunciation would amount to an obscenity. (The calls had been broadcast in English.) This led to the return, on March 15, 2000, of the wonderful heritage calls we all know and love -- and were again said in English at the top of every hour -- KHJ! In 2014, KHJ was sold to Immaculate Heart Radio and is once again in English with Catholic programming. WHERE ARE THEY NOW? : After KHJ went country, PD Chuck Martin went over to KWST. When he took off for sick leave, they replaced him with John Sebastian, who thought the K-WEST calls meant nothing. So he dropped them and launched magic 106. Most of the KHJ staff from 1980 went to K-WEST in 1981. In 1982, Martin began a six-year teaching stint at Chapman University. He now owns an ad agency and a production/recording studio in Orange County. Shana made a name for herself among various AOR stations in the L.A. market including KLSX. Humble Harve has worked on KRLA. Mark Elliott continued hosting the nationally-syndicated Weekly Top Thirty. Charlie Van Dyke owns a broadcast service in Scottsdale, Arizona. He worked morning drive at KRTH 101.1, broadcasting remotely from his Scottsdale home. He recently left the station after the remote broadcast was disallowed. Sadly, The Real Don Steele passed away August 7, 1997 at age 61. There are numerous tributes dedicated to him on the web. Bill Drake, 71, succumbed to lung cancer on November 30, 2008 (info found at radioinsight.com). THE LEGACY CONTINUES? 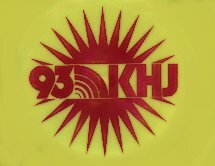 : A talk station in the high desert, 1380 KHJJ, promotes itself as "KHJ". There is an FM station in Canada with the call letters CKHJ, at 93.1. On December 31, 1976 at 5 PM, KHJ began their countdown of the year's top 93 songs. The countdown was repeated at midnight. Preserved here in Real Audio is the ending of the #1 song of the year, followed immediately by the KHJ legal ID and the introduction to "Countdown '76", with a wonderful recap of the year's highlights as only KHJ could tell it!